Oh Fall, how cozy you are! I love crisp weather and comfort food and there’s something lovely about putting together a simple Fall tablescape that reflects my mood. Weekends are meant for enjoying good food and a glass of wine… or let’s be real more like two! There’s something healing about this season. I’m happiest when I can put something in the crockpot and let the whole house fill with the aromas of something heavenly, that is sure to fill our bellies to content. 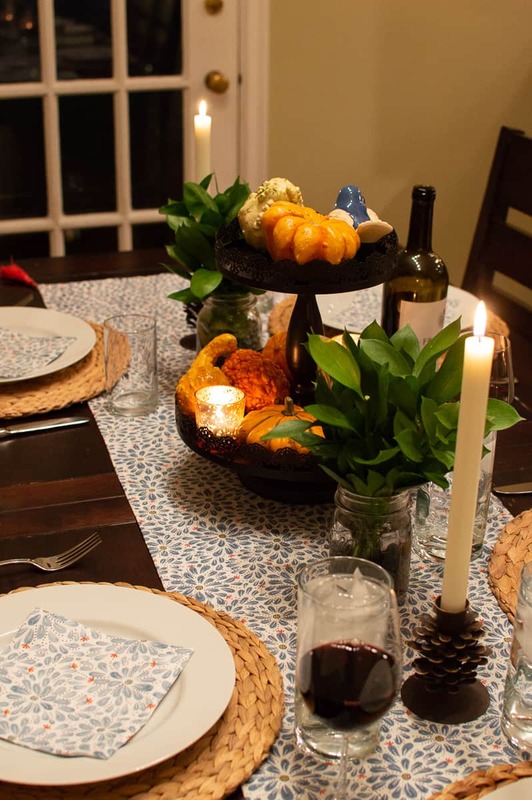 I love setting the table, but to be honest I usually only have a few minutes to get it set before food is ready and my family is begging to eat. My philosophy is to keep it simple, but include some beautiful touches like candles and greenery. 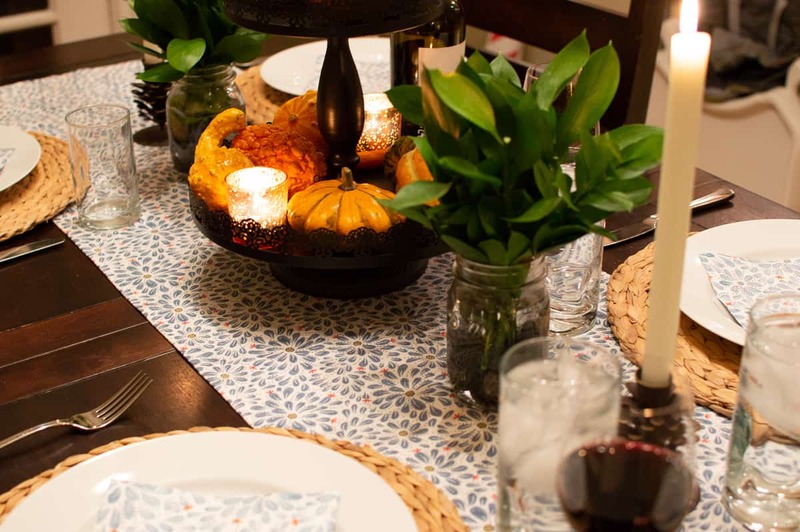 Fall is the perfect season to sit down with friends and family over a beautiful table and there are so many options like this festive Fall Thanksgiving tablescape. Start with a floral or patterned table runner. The one I’m using is from IKEA from a few years ago, but you can find a similar one like this one. While it isn’t floral, I love the diamond pattern and the fringe. 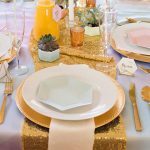 Add in different textures and styles to create a unique tablescape. 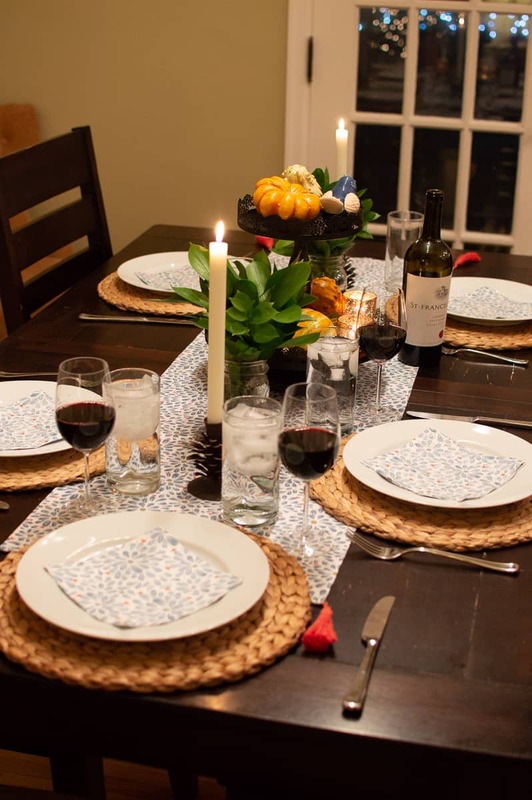 These rattan placemats from IKEA are affordable and look great with simple white plates on top. Now I’m using some paper napkins that match the table runner from IKEA, but you could punch it up a bit with some cloth napkins that complement the table runner I’ve suggested. This set of 12 are affordable and oversized, perfect to cover a lap! I’m using my regular silverware, but I’m also a huge fan of gold cutlery, and finally bought some (after these photos were taken) that are similar to this set. Add some wine and water glasses, and your place setting is complete. 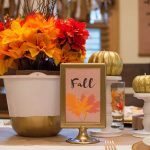 To create this simple Fall table centerpiece, I pulled out one of my many tiered stands. These babies are versatile and can create the sweetest vignettes for the season. Check out how I used this same stand to display my Fall Family Bucket List. I’ve curated a selection of trays that would work handsomely on your own table. 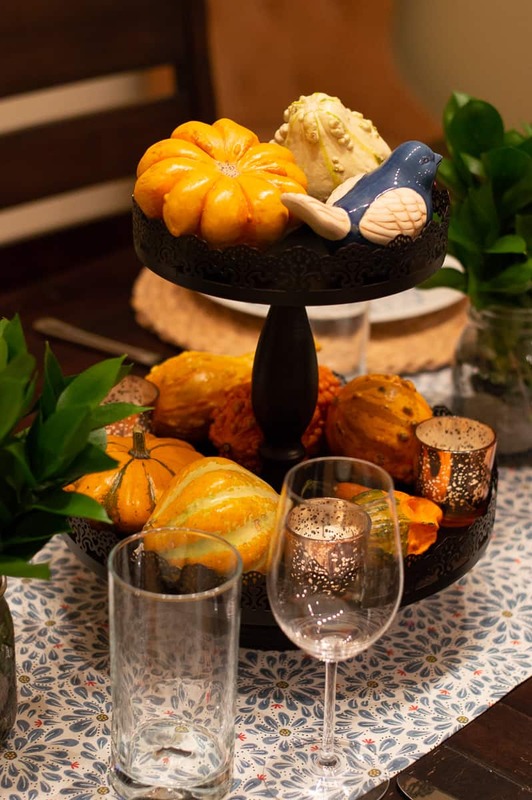 Create a lovely table centerpiece using a tiered tray, some gourds, candles, and this little bird accent. Now that you have your tray selected, it’s time to fill it! These gourds can be found at your grocery store, and even Target, where this set is from. Arrange them in the tray and fill in spots with some mercury glass votives. I highly recommend you get a set, because you will find uses everywhere. Add in some decor items. I recommend you shop your home first. This little bird is one I picked up at Michael’s some years back, and I love to bring him out on occasion. This little gold bird, or this set of two, would work well with this color scheme. I love these pinecone candle holders that I bought at a local home and garden store. 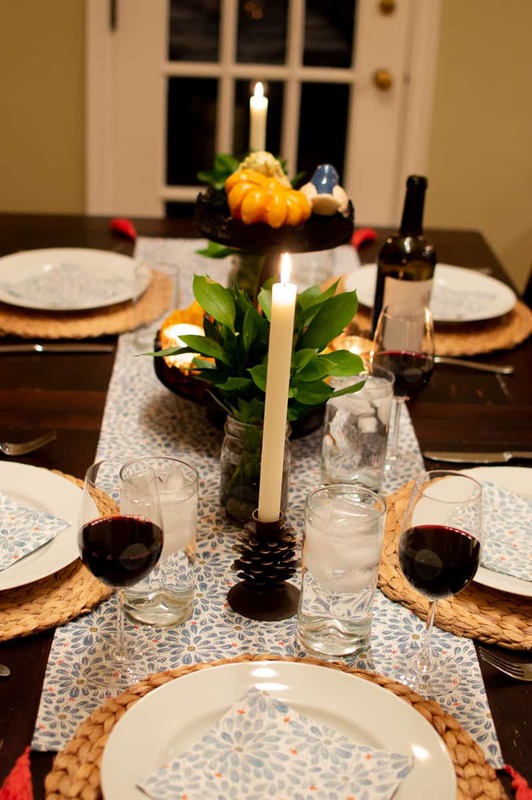 Adding tapered candles casts off a warm vibe over your table. 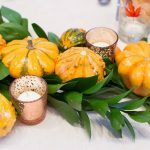 Candles are everything and so easy to add to a simple Fall tablescape. Last, add in some greenery to a mason jar is a great way to add some lush elements to your table. I love the pop of green against the yellow and orange gourds. Trader Joe’s or your local garden center or floral shop are great options to pick up some affordable greenery. But you could also go the artificial route with something like this, this, or this. There you have it! Now go grab a glass of wine and start pouring over your favorite recipes. 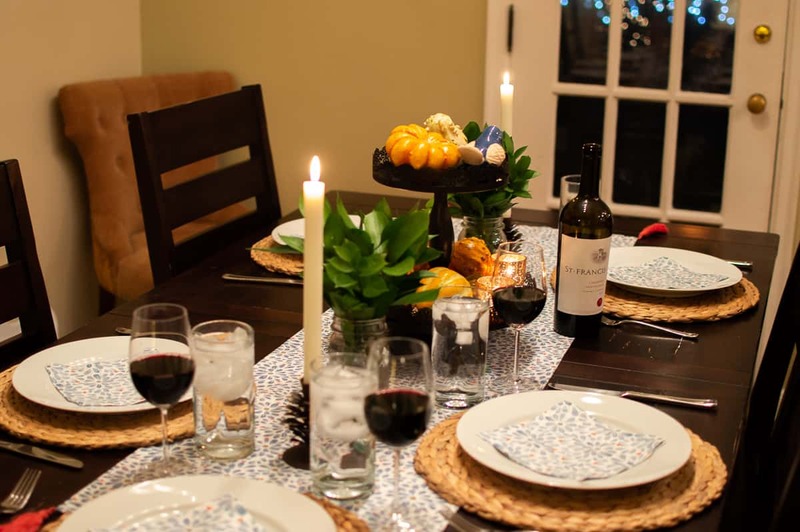 Your table is set, now onto the hard part of deciding what to serve for dinner. Enjoy! 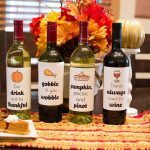 If you’re looking for other Thanksgiving ideas, check out these free Thanksgiving wine labels, or more tablescapes here and here .